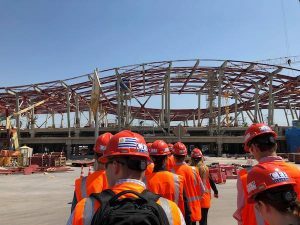 After eating a hearty breakfast at the hotel, our first morning in Santiago started with a trip to the expansion project of the Comodoro Arturo Merino Benitez Airport. 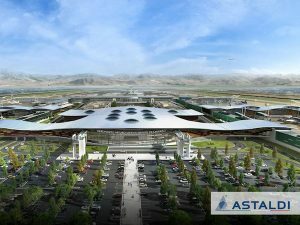 To support the increasing number of airlines and passengers, a new international terminal is being added. 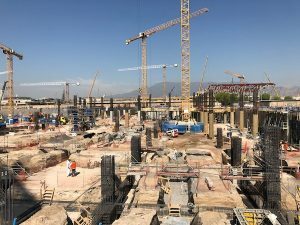 This $900 million expansion project currently stands as the largest construction project in the country, as well as the largest public project in the country in terms of budget, infrastructure, and number of laborers. 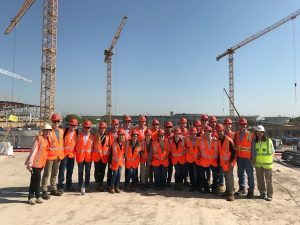 This site is also the largest project seen by our GLCM students in the history of the program. It is expected to be completed by 2020. 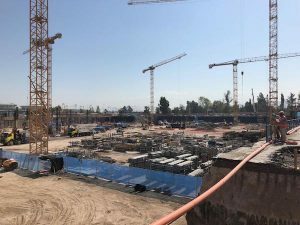 The tour of the site was led by representatives from Nuevo Pudahuel, the managing company of the Santiago Airport. 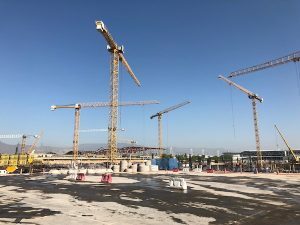 The new international terminal and connected piers will span over 200,000 square meters to increase the airport’s capacity to 30 million passengers per year. With this addition, the current international terminal will be converted to a national terminal. At the time of our visit, 10 tower cranes were in use and over 2,000 workers were busy on site. The project managers accompanying us explained that at the project’s peak construction, mid-2018, there will be over 3,000 workers on site. Our tour began with a walk around the perimeter of what will be the main terminal. Ground construction began in June 2017 with the removal of the existing parking lots in that location. During our visit, we were able to see the layout of the main services for the terminal and attached piers including hot and cold water pipes and electrical layout. This terminal will include an underground level devoted to baggage handling which provides inner routes to each plane to expedite the loading and unloading process. Part of the underground construction included over 700 structural pillars, 15 to 20 meters deep. At this time, the crews had constructed 549 of these pillars. Because of the high volume of concrete needed to complete this project, a batching plant was constructed nearby to reduce the transportation period of the material. Due to safety reasons, the batching plant could not be built directly on site as desired. One challenge for this project had to do with pressure from groundwater pushing up on the terminal base. Because of the size of the terminal, an underground net was needed for drainage and to equalize the pressure exerted by the groundwater to prevent any damage to the foundations. Also, because of the hardness of the surrounding soil, the retaining walls were able to be held at a 1:5 slope. Because the area receives very little rain, there was no need for a shallower slope or extra support. However, shotcrete will be used as an extra support layer over the retaining wall during the rainy season around June. After visiting the main terminal, we took our bus over to the connecting pier that had begun construction about 3 months prior to the terminal. The piers serve as he concourses where new gates and bridges are being added. After the completion of the project, the airport will have over 65 bridges in total. 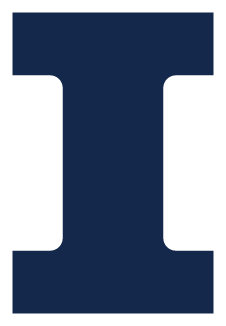 The pier that we observed will be operable by early 2019. The roofs of the piers are designed to look like waves to resemble the Coastal and Andes mountain ranges which surround Santiago, as well as the Pacific Ocean. The main structure of the pier was completed during our visit, and crews had begun working on the façade. The ground floor of the pier will contain the services for the pier and planes including electrical, water, and fueling. The 2nd floor will be for arrivals, and the 3rd floor will be for departures. The main structure of the piers and terminals are being built using steel. In Chile, construction generally prefers concrete over steel. However, this project utilizes steel for sustainability and flexibility purposes. Santiago lies in a seismic area so the steel structure provides strength and longevity to the airport in the case of an earthquake. Another interesting feature of the structure is the use of expansion gaps every few meters to allow for separate oscillation between sections in the case of an earthquake. There is also a gap between the main concourse and each bridge so that if one section were to fail, the remaining structure would be able to remain separate. The GLCM crew is looking forward to future vacations to Santiago to check out the final product of this project.